"I have been a fan of masternode (MN) coins for a while. A good resource for researching MN coins is: https://masternodes.online. Getting in early is important for many MN coins, since the more MN nodes are started, the more your reward redistributed to other MN’s. Also, the price of MN’s tends to inflate over time. DASHG is a fork of PIVX, but uses DASH tokenomics by design. Their reward structure is above. The premine was 2.5% (450,000 DASHG), which goes to the developer. The developer is anonymous and goes by the handle “Mastermind” on Discord. The developer wallet is found below. Activity has been minimal, which is a good sign. This suggests that the developer isn’t just creating a bunch of masternodes to gain a monopoly over newly minted coins. Also the Dev reports having only 2 MN’s. The total supply right now 537,000 tokens, so the Dev currently holds about 66% of the total circulating supply. This is a bit intimidating but the ROI is currently 1753% so the relative amount controlled by the Dev will continue to decline as new coins are minted. 5. Masternode collateral is 1000 DASHG. There are currently 96 MN’s created. The rate of MN creation is relatively slow (5 MN/day at most). This is a good sign, suggesting the Dev isn’t just generating a bunch of nodes for himself. 6. DASHG is currently being traded on 3 exchanges(Graviex and Crex24 have the highest volume). 7. Upcoming Green paper release and product release are promised and in the pipeline. 8. DASHG community is active on Discord, but the Telegram group (https://t.me/Dashgreenecochat) has only 26 members, which could be a good opportunity to get in early before the crowd. 9. DASHG appears to be in accumulation mode and has good support around 30,000 sat range. 10. Starting my MN was quite seamless. I started a server on Vultr for $5/month and run my MN without any issue. 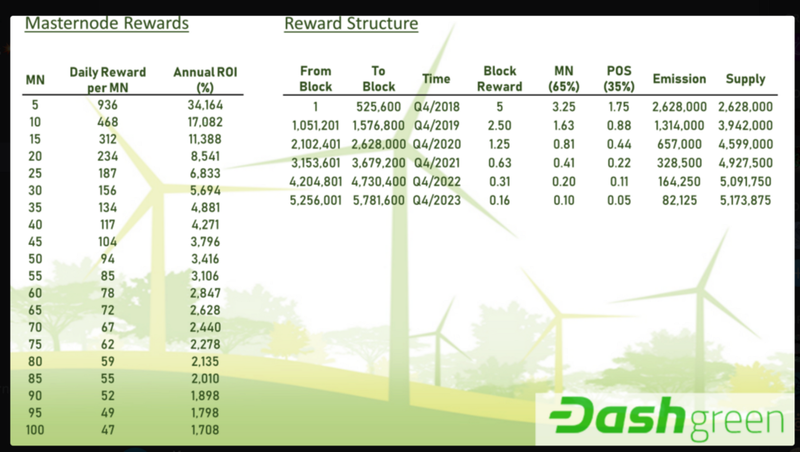 Instructions can be found here: https://github.com/databir/DashGreenCoin_MN. If you have less than 1000 DASHG, you can take advantage of Gentarium shared node service: https://mn.gtmcoin.io. DASHG is a promising new MN coin with a growing community. The only disadvantage that I see is an anonymous Developer. Investors in MN coins are often wary about exit scams, in which the Developer dumps the premine on exchanges. Most privacy coins these days have anonymous teams and many are legitimate projects. Could this be an exit scam? No way to know for sure. However, so far, I have not yet seen any suspicious activity or red flags by the Developer wallet and conversations with him on the Discord channel has been only pleasant. I am willing to give them the benefit of the doubt. Overall, this is a high-risk high-reward play (even Bitcoin these days is an extremely high-risk with a massive drop to $3400 today, holy cow!). I’m going to hold onto my DASHG and see where it takes me. I’m liking this community so far! p.s. 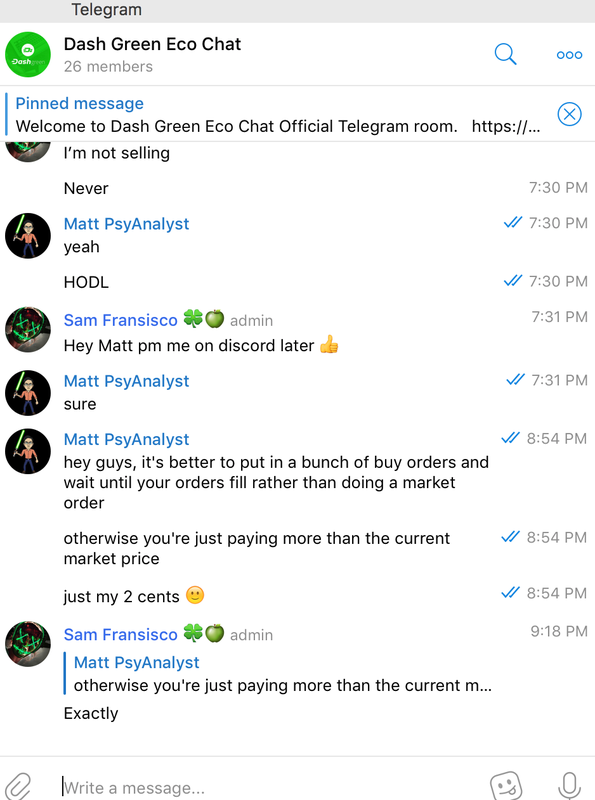 I have a private Telegram group where you can discuss ideas with my fellow members (https://www.patreon.com/MattPsyAnalyst). Cheers and good luck!" Current time: 2019-04-19, 04:14 PM Powered By MyBB, © 2002-2019 MyBB Group.